Priced: $179.95 - $189.95 Rated: - 5 stars out of 5 by 16 reviews. The Men's Sundowner GTX Boot by Vasque. The boot that built the brand has a reputation for longevity, comfort and old school style, which may explain why it is as common in the city as it is on the trail. FEATURES of the Vasque Men's Sundowner GTX Boot. SPECIFICATIONS of the Vasque Men's Sundowner GTX Boot. The Vasque Sundowner has gained a reputation as an excellent hiking boot for a variety of conditions. Vasque continues that tradition with the Sundowner GTX. This Gore-Tex lined boot is completely waterproof for the soggy conditions that so many of us hike in and retains all of the quality and comfort of an old school full leather boot. Do you wish the good old leather mid-weight boots would come back? Well, they never actually left. The Vasque Sundowner GTX Boot is a mid-weight backpacker with a reputation for comfort and old-school style, which may explain why it's as common at the grocery store as on the trail. It's also equally at home under the weight of a pack or on a casual day hike. An iconic waterproof backpacking boot with clean, classic lines and a remarkable fit, the all-leather Sundowner GTX has a reputation for durability, comfort, and support. Popular on long-distance epics like an A.T. thru-hike and for more modest day hikes. 27 people have already set their own price. I usually use hiking boots for all my activities, work, home shores, vacation - outdoors- and when I ride my motorcycle. I was looking for a leather boot so that would provide a cleaner look for work. I have long narrow feet with weak ankles, so I prefer to use high top shoes and I am very particular with the shoes I buy. I have always worn Asolo boots (Asolo FSN 95 and FSN 85) and they are great boots. They are very comfortable, durable and they protect my feet very good keeping them warm and dry even when I ride in the cold rain. I considered the Asolo TPS520 GV, but they are expensive, so decided to give the Vasque Sundowner GTX a try. I was concerned about some of the comments regarding the book being made in China; this should not be a concern. 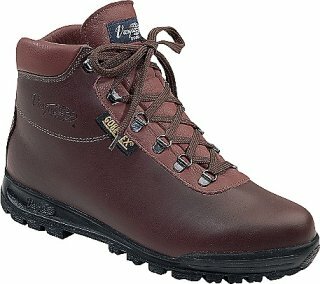 I ordered my Vasque boots from Zappos on December 23 and received on the 25 as promised and with free shipping. Great service, I did not believe I would receive them for Christmas - already gift wrapped with a painted bow on the box and I did not have to wait long lines at the mall - great! The Vasque boot felt very good right out of the box. It provided a good snug comfortable fit and they look great. Even though my wife does not agree, I feel I can even use them with a coat and tie. They look like a well constructed shoe and a think they will be as good as the Asolos. Hard to believe no one has reviewed these boots. Vasque has been making this same boot for decades, even if the name for it has changed. Mine are 15 years old and counting. They just do not wear out. Extremely comfortable footbed. Not that it is cushioned, it just has the correct contours. Maybe like a Birkenstock (but I have not tried those). Everyone I know who has these boots are big fans of them and they have had them for a long time.. The leather and the sole are both thick and a little stiff. May require some break in but will never be too flexible. I have owned a lot of boots, but these are the best. I had heard both good and not so good reviews of this boot. However, when I was looking for new hiking boots and the Vasque Sundowners had the features I wanted so I purchased them. I'm in the process of breaking them in now with short day hikes and working around the house. I plan to use them on an AT section hike through the White Mountains in NH this summer. So far, they feel very good on my feet. No blisters! I bought these for work as I needed a winter boot that was waterproof and built to last. I wore them on my morning shift thinking I'd only be in them for a few hours to start the break in process ended up getting overtime and worked in them for thirteen hours - no blisters. Have hiked in them since in the snow and they kept my feet toasty warm. I love stepping on jagged rocks and slippery logs with confidence. I love these boots, they look great, they feel great, but more than that, Zappos is great. Last month I ordered three different items of footwear from Zappos, one was delivered in three days the other two were delivered in two days. One I ordered on a Saturday night and received it on Monday; the other I ordered on Sunday night and received it on Tuesday. I don't know how they do it. I've had my Sundowners for 20 years, and though they're looking a little rough now, they're still the great boots they've always been. Still comfortable, still with excellent tread, still dry, and still my favorite. Vasque and others have moved on with all sorts of hi-tech boots and shoes, but the fact that Sundowners are still big sellers testifies to the great value of these boots. Thumbs up after all these years. This is a great boot. I've worn them for about a month and about 20 miles of walking from city streets to mountain dirt roads. They are comfortable from the start and getting more comfortable as they get broken in. I've been a fan of Vasque boots for about 40 years and theses Sundowners remind me why! And, of course, the Zappos service is unbeatable! I just replaced my older (~8 yrs, resoled once) Sundowners, and I can already tell the new version will not hold a candle to the old. My older Sundowners were from the days when Vasque was still manufacturing in Italy and using vibram soles. These are now made in China and it shows, and they've dropped the brand name soles. The size is off, even though I bought the same 10.5 - there's a wierd combination of fit by length but too much room in the toebox, and there's significant slip in the heels that I can't fix with different lacing styles. As much as I hate to say it, if you got used to the old school, you will be disappointed by the new. When they where made in Italy they where best hiking boots ever made!!!! I feel the Vasque Sundowner's are heavy and not as comfortable as Asolo or Zamberlan. TOUGH BOOT. VERY FLEXIBLE AT THE TOES & NOT GOOD IF YOU HAVE ANY TOE ISSUES AS IT PUTS TO MUCH WEIGHT ON YOUR PAWS. SEEMS DURABLE AND VERY WATER PROOF. $150 BUCKS... PROBABLY LAST IF YOU DONT HAVE THE ABOVE PROBLEM. BOOT SEEMS READY TO GO FOR THE SOLID FOOT.